Lightweight Rechargeable Sweeper is rated 3.5 out of 5 by 22. For quick jobs you really won’t want to go back to lugging a heavy vacuum around once you’ve seen the astonishing cleaning power of our battery-powered sweeper. With its smooth gliding manoeuvrability, our Lightweight Sweeper adjusts effortlessly to look after all floor surfaces. The handle lies flat to slide under low furniture. It features a clear front window, so you are able to see when it's full and needs emptying; there is no need to get your hands dirty with its non-touch dirt container release, simply press the button and the dirt is released from below! What you might not expect is that it’s such fun to use, you’ll actually want to do the cleaning again. Cordless. Cleans on bare floor and carpets. Lightweight with swivel handle connection for ultra manoeuvrability. On/off foot-operated button for easily operational use. 45 minute runtime. Easy-empty bin. 9in cleaning path. The sweeper weighs 2.25lbs and comes with a charger that plugs into the wall socket and then into the back of the unit. Rated 5 out of 5 by Janne from Easy to use with batteries Though this is not adequate for cleaning the whole house, it is certainly very handy for a quick sweep around, very convenient and efficient for small jobs. Rated 3 out of 5 by Lisa from Lightweight and easy to handle Im glad I got this at the reduced price. It works very well on hard floors, and is hard going on some carpets. I was hoping it would be as good as my existing bissel rechargeable sweeper, but alas is lacking. Rated 5 out of 5 by queenie from Brilliant Bought this for a friend because I've already got one and the friend was delighted. It's lightweight and a very good cleaner. Rated 1 out of 5 by heljen from not for me I sent this back after only three days, I am sure for very thin carpets or wooden floors it would be great not for me. Rated 5 out of 5 by Lizzie from Great little helper. Bought this to use as an addition to my usual cleaner. So useful for those annoying crumbs and other bits which need attention. Easy to use and easy to charge. Just wish it had a light on to let you know it is fully charged. This does not detract from its usefulness. A good buy. Rated 1 out of 5 by Mrs Tonka from Disappointing I bought this sweeper as a replacement and am disappointed with its performance. I find it awkward to manoeuvre, but it is useful for picking up crumbs. Rated 4 out of 5 by sr1942 from Nifty little cleaner! I bought this lightweight cleaner, and have been pleased with its usefulness. 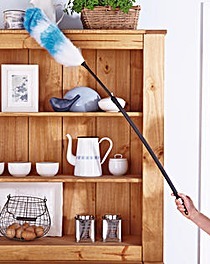 It is sufficiently light to make sweeping a pleasure, and is very easy to clean. Perhaps the only drawback is that the red light on the cleaner is on all the time when charging, so that it is not clear when the battery is fully charged. Apart from this, I'm extremely pleased with it. Rated 5 out of 5 by Freepsy from Handy Cordless Sweeper This sweeper is very handy to give the house a quick once over between hoovering, or for picking up crumbs and bits that have been dropped or things like cat litter. This sweeper does not drop bits back on the floor whilst sweeping, which I have experienced in the past using other brands. 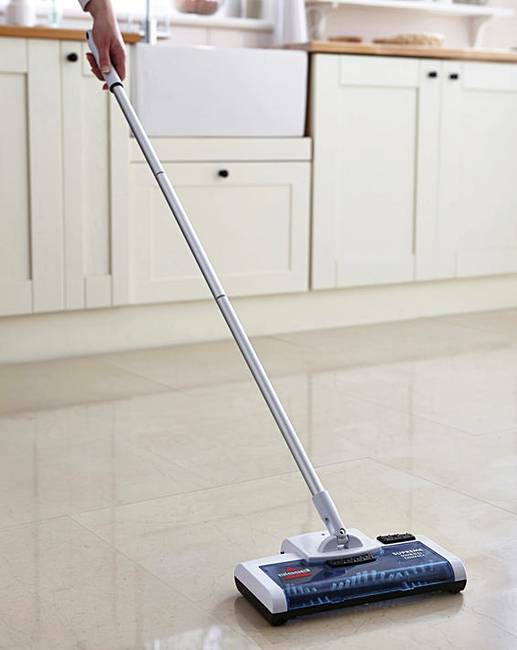 The sweeper is lightweight, fairly quiet, has a decent run time and is easy to charge. The price is also good value for money. I would definitely recommend.